Teen idol Justin Bieber, recently joined pop royalty Kings of Leon, Coldplay, the Black Eyed Peas, Metallica and Lady Gaga as the newest member of the Tap Tap Revenge franchise for iPhone. Tap Revenge faithful as "amazing" and way better than most had expected it to be. 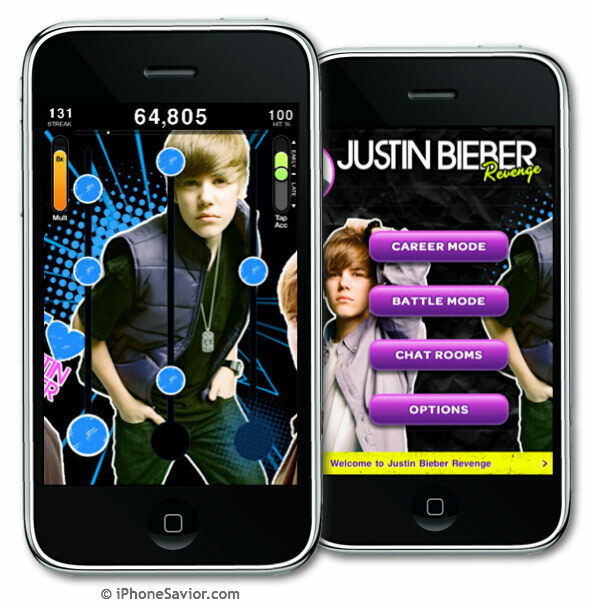 The app is loaded with 11 Justin Bieber tracks including his top ten hit single "Baby", featuring rapper Ludacris. live peer-to-peer action via Bluetooth. True fans already know that Justin Bieber is a confirmed iPhone fanatic, which makes the chances of catching Justin in the app's Chat Rooms even more tantalizing for the Bieber obsessed. Justin Bieber's recent debut appearance on SNL (Saturday Night Live) with Tina Fey (below), is expected to be only the first high profile TV spotlight for the wildly popular post-puberty singer. News is beginning to circulate that a TV pilot entitled "Leave It To Bieber", is currently being shopped to the networks showcasing Justin playing himself as a reluctant pop star living in the burbs in a "Hannah Montana" style sitcom. Both Disney and Viacom are rumored to be in a bidding war for their first shot at producing a show starring "The Bieb". "I hate Justin Bieber, but I just can't put this app down," said committed iPhone gamer Elam Nikserof, "It's totally addicting and that song 'Baby' is stuck in my head like gooey brain taffy. Tapulous nailed it with this one."